Originally drawn for publication in Harper’s Weekly , “Emancipation” pictures Columbia (the female representation of America) presiding over a scene imagining the difference that Lincoln’s Emancipation Proclamation would have on slavery and former slaves in the South. 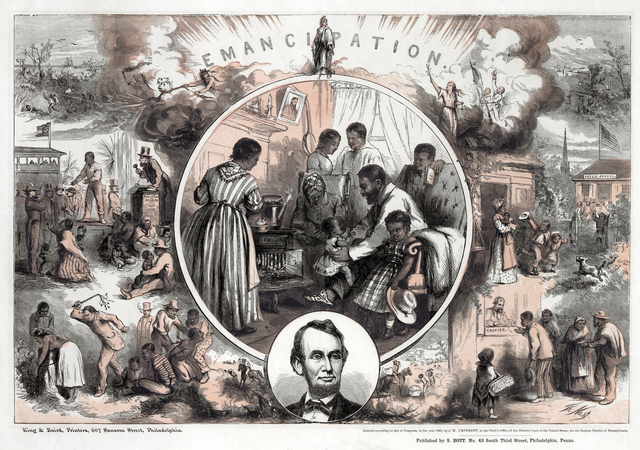 The original 1863 illustration omitted Lincoln’s image at the bottom, instead featuring an abstract image of heavenly intervention breaking a slave’s chains. The inclusion of Lincoln’s visage highlights his ascension from sometimes-maligned president into a national martyr and revered Great Emancipator, and also begs the question of who (in the public imagination) freed the slaves.